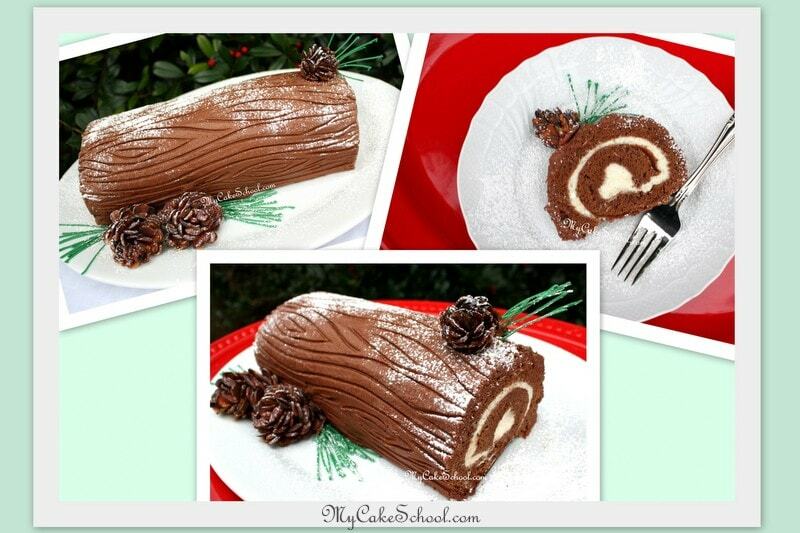 We used this delicious Chocolate Cake Roll recipe in the Yule Log Video Tutorial that we created for our members. For the filling, we often use a light Whipped Cream Filling but really, anything goes! In another bowl beat the 5 egg whites until you reach soft peak stage. Slowly add the 1/4 cup sugar so you will not deflate your egg whites. Continue beating until you reach stiff peak stage. Fold your egg yolk mixture into the egg whites then begin folding in your flour mixture also. I gradually add the flour mixture. Continue folding until all the dry ingredients are incorporated. Spread the batter evenly in you prepared pan. Bake at 350 degrees for 12 - 15 minutes or until cake springs back. When the cake comes out of the oven, turn it out onto a clean towel that has been dusted with confectioners' sugar. Peel off the parchment paper. Roll the cake up in the towel, starting with the short side. Let it cool on a wire rack until room temperature. While this is cooling, make your whipped cream. Unroll the cooled cake, spread the whipped cream filling and roll up again. Place on a serving platter and and frost with buttercream of your choice. Do you have the recipe for the whipped cream? (We linked to it on our Yule Log video but not from this cake recipe) – I hope that you enjoy it! I need to make a cake roll but has be more like devil’s food cake. Do I just add more cocoa powder so it will be a deeper chocolate. So help me I’m going to make a log cake. I have been putting it off too long. That’s a beautiful Log Cake. Hi! Do I change the recipe much if don’t use cocoa powder as I don’t like chocolate myself? Hi Andreia, I’m sorry butI don’t know how to make a substitution for the cocoa as I have never tried that. It would be best if you found a cake roll online without cocoa powder. Hope you find one that works for you.